If you are a fan of NCSOFT MMOs – specifically WildStar, Lineage II, Aion and/or Blade & Soul (the Guild Wars franchise being conspicuously missing from the announcement) and you’re in the LA area for E3 this coming week, then you may want to stop by Hotel Figueroa on Tuesday 16th from 6pm (until 9pm). 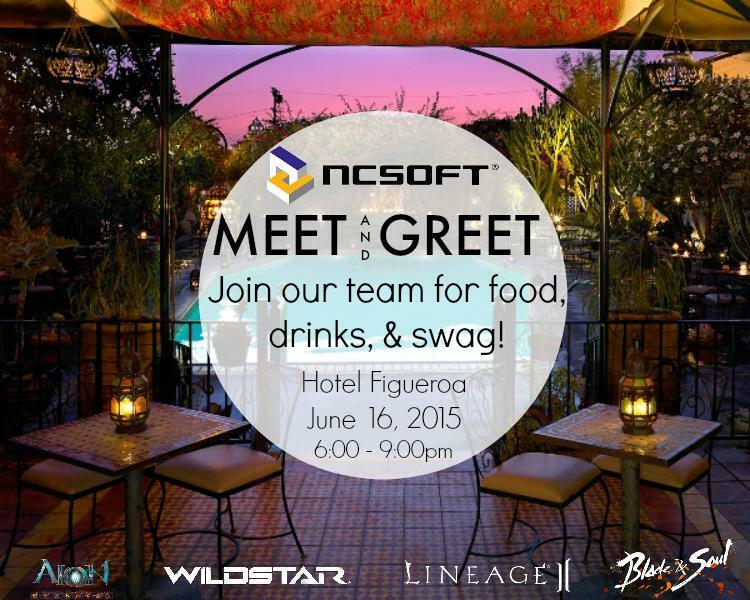 NCSOFT is hosting a meet and greet event at the Hotel Figueroa in Los Angeles. Swing on by and meet the team, while we ply you with some good food, great drinks, and free swag. The Small Print – Well-drinks, wine and beer will require drink tickets, which will be provided while supplies last. All ages welcome, must be 21 and over to drink alcohol, ID will be required. No details yet as to what swag may be available, but the lure of food and drinks only a couple of blocks from the E3 convention may be enough for most!